Flight of style: The colour of his B-15 flight bomber is midnight blue, the original shade used for the early 20th-century designs. Moreover, his sunglasses are similar to those worn by the first aviation pilots. Essentially, Steven Patenaude makes aviation style even cooler by embracing its vintage elements. In Autumn/Fall, trees survive the cold season by shedding itself of leaves. Case in point - he’s stylishly surviving the winter with a jacket designed with autumn-leaf patches. If Mufasa was human, and roamed the streets of New York. 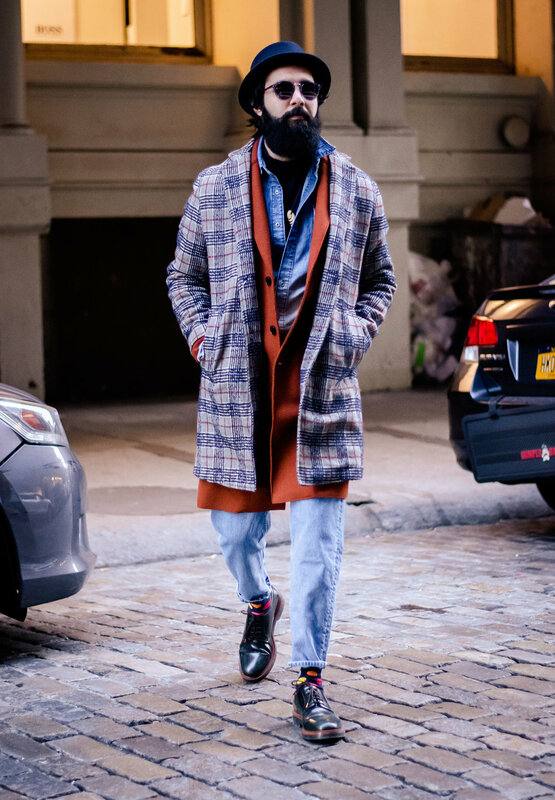 The “mille feuille” effect: Veer demonstrates a master class in layering with three different Zara jackets: a plaid coat over a burnt-orange coat, which is over a denim jacket. The cherry on top is his polka dot Happysocks. With his over-sized scarf, Kareem looks like he’s wondering a desert to a mysterious location (But he’s in New York, where he can still find a mysterious location lol). 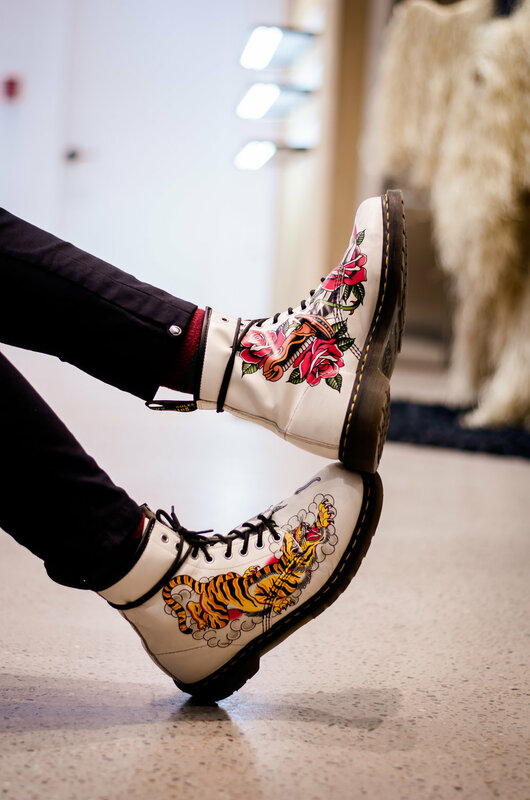 Corey stated that individuals with a good sense of style should strive to offend those with a bad sense style (lol). 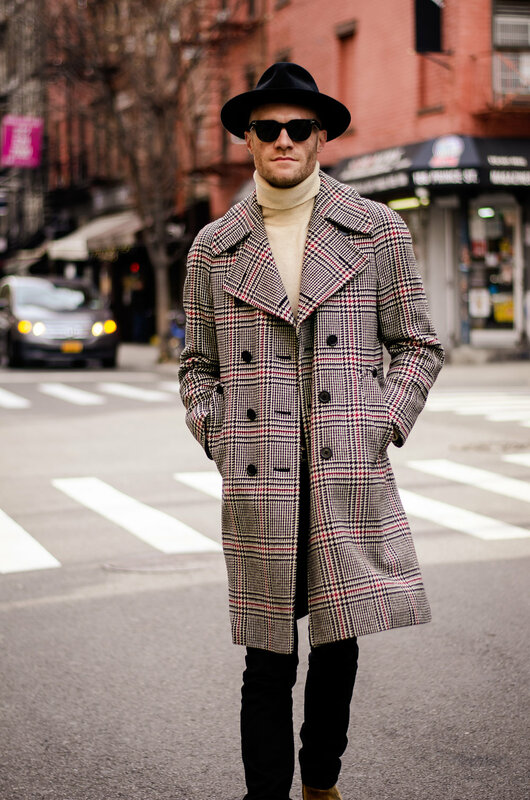 He’s certainly doing that as he keeps it cool with his sunglasses and top hat (reminiscent of the Blues Brothers), and Dries Van Noten turtle-neck paired perfectly with his vintage, plaid coat. As a visual merchandiser, Raza understands the power of the accessory: The beanie, sunglasses, lightweight scarf, and driving gloves overlook the fact that he’s wearing a simple mink-collared jacket. Deep nostalgia for temperate days: His winter outfit features warm-coloured pieces such as his green shearling jacket, and blush-red sweatshirt. Also, given the frigid temperatures, he bravely ditched the socks. The resulting combination of ankle exposure, plaid pants, and Raf Simons sneakers is a style move worth stealing. Igee Okafor is grinning because he knows exactly what he’s doing: Atypical layering (a double-breasted coat over a polo, which is over a turtleneck) familiarized by two shades of blue. In addition, his made-to-measure Indochino coat, and J. Crew trousers make him the sharpest dresser within a 100-mile radius. He’s not wearing the orange jacket in its totality. But that’s the point - it’s the only messy factor. This style move provides a nonchalant flair to his otherwise simple look. Chengge Tan proves that grayscale Burberry is just as captivating as its’ vibrant counterparts.